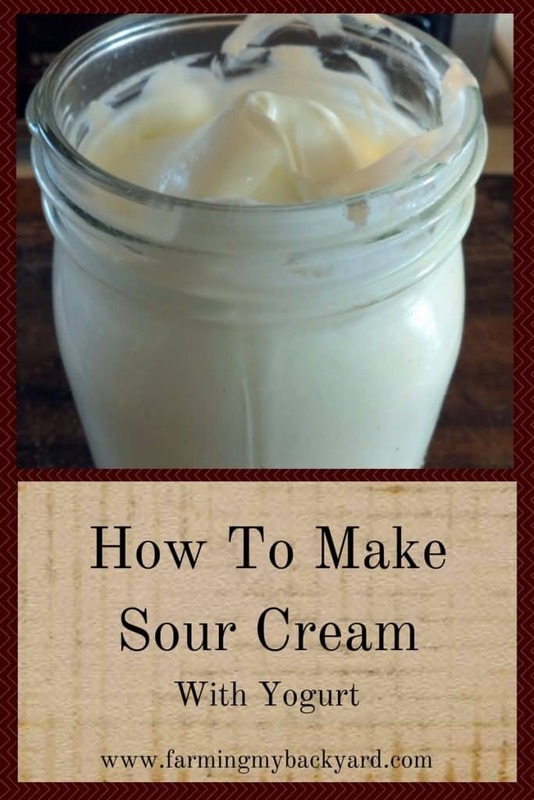 Did you know that you can make your own sour cream? I recently discovered that making sour cream is SO EASY! All it takes is cream, and something to culture it with. You can make sour cream using raw vinegar with the mother, milk kefir, yogurt, or even buttermilk! You can also make it using a starter culture from Cultures for Health if you prefer. It’s So Easy To Make Sour Cream! All you have to do to make sour cream is stir in a 1-2 tablespoons of live yogurt into a cup of cream and let it sit in a warm place overnight! If you use kefir or extra kefir grains or buttermilk instead of yogurt, you don’t even have to keep it warm. It really is this easy. I LOVE it! You’ll have the best results with pasteurized heavy whipping cream. Raw cream has a lot of other bacteria so it doesn’t culture as well. The super ultra pasteurized stuff doesn’t always set up correctly either. For more troubleshooting, check out the detailed page from Cultures for Health. Of course there are about a billion ways to use sour cream, but my favorite is to melt cheese onto scrambled eggs and top with tomatoes and sour cream. 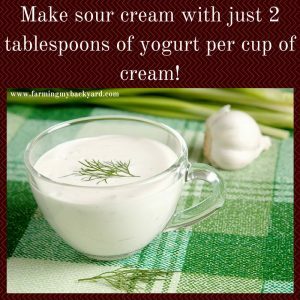 Sour cream also makes a yummy dip for vegetables when you flavor it with your favorite herbs and spices. Parsley, garlic and salt make a nice ranch-like dip. You can also stir sour cream into casseroles and sauces to make a stroganoff. Start with a nice broth base, and add it in after turning of the heat. 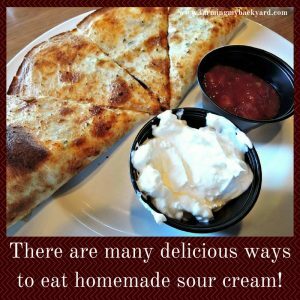 What’s your favorite way to eat sour cream? It’s interesting about Nigerian milk . . . lots of cream, but it takes several days to separate out. I was hoping to do more with cream from our does, but sadly we drink all the milk before cream separates out. The only time a bottle has separated in our fridge was when one of my milk-drinkers was sick for a few days and we had a back up, then I was delighted at how much cream was at the top of each bottle! Our baby goats are still on the mamas during the day, though, so maybe when the babies are sold and we’re milking twice a day we’ll get enough for sour cream – I would SO love to have homemade stuff :-). The downside to being an urban/suburban farm . . . never enough goats! You know, I didn’t even know the cream would separate if you leave it for a few days. That’s really exciting. Everything I’ve read says it doesn’t. I probably will keep buying cream because our goats are probably just enough for our milk needs but not all the extras! I’ve made “mock sour cream” with cottage cheese blended with a little milk. Everyone’s first reaction is “this tastes just like sour cream”, but it doesn’t have the slightly “off” fermented smell. I wonder if culturing it overnight with a little yogurt or buttermilk would give it the right aroma? Anyway, something to try. Even without it blended cottage cheese is a great (and much healthier) option. That’s a good idea. I’ll have to try it sometime and see how it works. I never thought about making sour cream. I’m not sure why, we make cheese and we go through quite a bit of sour cream. Definitely going to try it, thanks! I hope it turns out well for you! I tried making sour cream with heavy cream unpasturized milk and vinegar. It has been sitting for 24 hours and still not thick. Anything I can do to thicken it? Homemade sour cream will not be as thick as store-bought sour cream. If I need mine a bit thicker I strain off some whey. I’ve never cultured mine with vinegar though, I hope it worked out for you! I saw a video where a woman made it with 3 tablespoons of cultured buttermilk to a pint sized jar of heavy cream and it looked very thick. Look on youtube for – Recipes From A Cheesemakers Journey: Sour Cream to see the video I’m referring to. I put a Tablespoon of vinegar in a cup of cream and taste. Should taste slightly sour….then stir well, put in the fridge and in the morning, best sour cream. Thick, great on baked potatoes with butter…I live on an island in Asia where we only have cream in a box. And no sour cream in he stores. So I am thrilled with this. Will try the yogurt way also. But dont always have yogurt. Do you use white vinegar or the apple cider variety? I thought that would make buttermilk. I would guess apple cider because it has more live cultures. I know if you put vinegar in milk it creates butter milk. I would suppose it creates sour cream when put into cream. I wish I would’ve read this yesterday. I would’ve definitely tried this. I’d have to do with yogurt because I cannot have vinegar. It’s seems really simple but doesn’t seem to make a lot unless I’m understanding it wrong. Once you make the starter, can you keep adding to it? Like sourdough? Right, you can make as much or as little as you need. You should be able to keep the culture going like sourdough. If the sour cream doesn’t set up after a few different batches, just refresh it with fresh yogurt. I love sour cream! I’m going to buy cream today and give this a try. Do you by any chance use goats milk for your sour cream? If so, how does it taste? I usually make kefir out of the goat milk because we drink it all before the cream separates. I bet it would taste great if it lasted long enough! Any particular amount of yogurt? Like 1 to 2 ratio or whatever? I like sour cream on Mexican food. Saw you’re in pdx. I live in Donald. Just wondering if you could use say, lime yogurt for a limey sour cream? You could also mix some buttermilk into that cream and let it sit on the counter at least 24 hours to thicken. Sour cream! Maybe this is technically crema? If you put it in the fridge and age it a couple of days then whip into butter, you have the best cultured butter, and bonus butter whey to make bread! PLEASE share how you do this! My favorite way to eat sour cream is Blueberry Sour Cream Pie! It was a farm specialty of my grandmother, and it is delicious. That sounds amazing! Is there a recipe? I would love that recipe also!! Sour cream angel food cake is also amazing!! Outside edges light & fluffy like regular angel food cake, fabulous flaky top but the center, omg while completely done has a texture similar to custard in a heavenly kinda way and it all has a slight tanginess that makes the whole thing deliciously, dangerously addictive! Is leav g on ththe counter sufficient, what is your room temperature? Cultures for health tecommend processing like uogurt, would using my yogurt maker produce a thicker product, interested inntrying this. The temperature that you culture it at depends on what strains of beneficial bacteria you are using to culture it. Try the yogurt maker and see how it goes! I had 12 nubians in the early 80,s I never mastered cheese but my yogurt was to die for. Would love to do it again but husband doesn’t want to have any thing to do with it. He’s over eighty now so tells me I just have to wait until he’s no longer here. My son says we will get a place together and have our goats and chickens again. In the mean time I’ll have to be satisfied reading about it. I hope you get to keep goats again. Thanks for reading! I’m sorry you feel like you didn’t get the information you needed. Making sour cream with yogurt is super easy. You just stir some yogurt with live cultures into cream and let it sit. Do you have any specific questions about it? I was wondering if I could make sour cream by putting the acv into a cup of kefir. I can’t do cow dairy and always have goat milk kefir on hand. Do u think that would come close? The kefir is already cultured, so I doubt acv would make much of a difference. You could try straining your kefir to get a thicker cream-like consistency. All of this sounds soooo good but…. Has anyone tried using just plain yogurt in place of your sour cream? I like both but I like the yogurt best.